One of the most common questions I get is "how long will my knife stay sharp"? I used to stress about this aspect of the sharpening process but only with restaurant knives, I say I USED to stress about it. I have since come to realize that there are just too many variables involved after I give a sharpened knife back in order for me to make a accurate prediction on the "how long" question. I have turned it around to the knife owners and ask them "how long will YOU be able to keep it sharp?" When I give a knife back, I can guarantee that is very sharp and will be able to handle any situation with flying colours. However, in the professional kitchen setting, where often the cooks don't even own the knives, are they going to take steps to protect the edge at all. Or are he knives thrown without any regard to the edge, are they subjected to Steeling Abuse ? Hell yeah, I have seen it happen and therefore I no longer feel guilty if "my knives" lose their edge in a few weeks. I do what I can in terms of angle and grit choice to finish the knife on. However, as I said there are so many variables with the big one being the steel. Is a 40 dollar knife used for 8-12 hours a day going to stay sharp long? The picture above is just something for kicks, I think some folks should keep a screwdriver in their block of knives so that they are not tempted to use the knife for purposed other than cutting food. 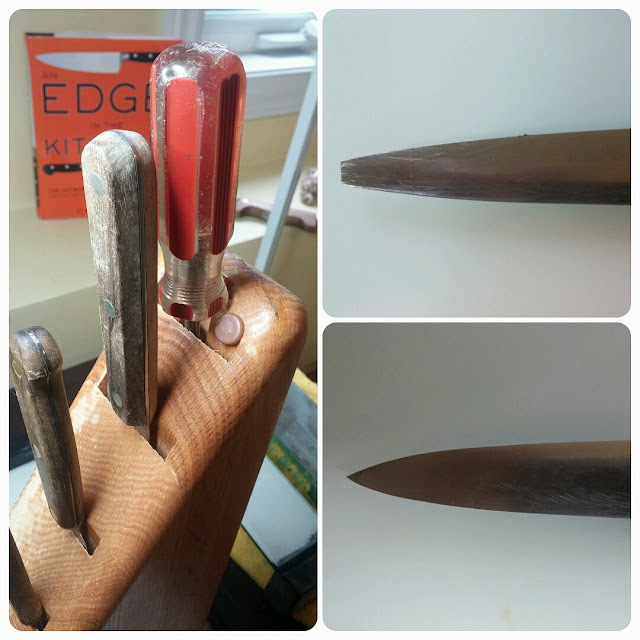 As seen in the paring knife before and after pictures above. Takamura above and Takeda below. Even these beauties are going to get dull, now due to their hardness they will hold the edge longer of course than your average Henckels or Wusthof but yup, in time and sooner than you think, they will lose their edge. People need to Sharpen Up, they need to be conscious of the fact that the edge is microscopically thin and will not stand up to the force subjected to it indefinitely, despite the quality of the knife. I've said it a million times, develop a Sharpening Plan so that you never have to use a dull knife. There is no magic formula, no "edge of eternal sharpness" that I can apply to a knife, use it yes, use it for cutting as much as possible but just keep in mind that you need to have it touched up and a thirty year old $30.00 Steel is not going to do the trick. Just be careful with the knife, store it properly and never put it in the dishwasher and if you keep it sharp it will be so much more enjoyable and effective. As a baseline, start with a 3 month rotation. Most people have a Go To knife that they use most often so naturally that will get dull first. 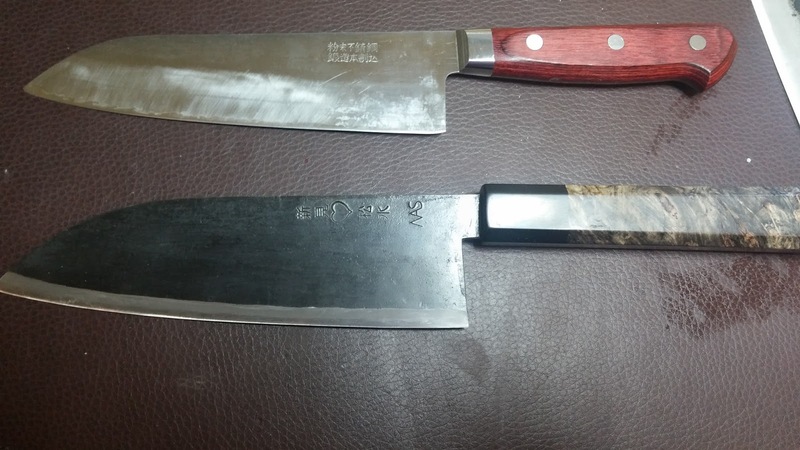 At the very least, get all the knives you own sharpened professionally and then go from there. Even if it is once a year, that is a Sharpening Plan. Professionally of course doesn't necessarily mean Good. 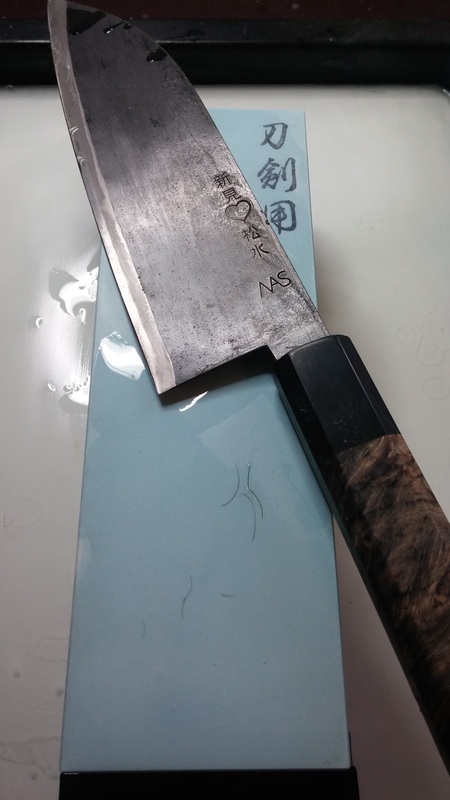 If you are interested in having your knives sharpened just ask the individual how he sharpens knives, ask him about his Japanese Water Stones....if there is dead silence for a few seconds, you should back away. Most folks who do sharpen by hand with water stones like me are very eager to discuss their technique, we love talking about our obsession and sharing information. I finished the beautiful Takeda in the picture here on the Naniwa Chosera 10,000 grit ultra fine, ultra cool water stone. EDGE RETENTION is OUR responsibility, I will do my part to sharpen it an angle and finish conducive to edge retention, however that is just a start, your part involves handling it properly and taking care of it and perhaps maintaining it with a good ceramic hone or very good Steel hone and using proper steeling technique, a gentle process not that slapping motion that some people think looks cool. I found another awesome place to purchase knives online in Canada and the owner, Chris is pretty cool, extremely knowledgeable and he carries dream knives. He also is a gifted handle maker. The Takeda and Takamura above are from his online store and he was kind enough to let me sharpen them.